New York City Department of Transportation (DOT) Commissioner Polly Trottenberg, Alta Bicycle Share incoming CEO Jay Walder, and Citi Executive Vice President for Global Public Affairs Edward Skyler today announced an agreement between the City of New York and Alta Bicycle Share to operate, improve, and double the size of the largest bike share program in North America. A $30 million infusion of private capital from Bikeshare Holdings LLC, a group of private investors acquiring Alta, supported by an increased sponsorship commitment from Citi of up to $70.5 million extended through 2024, and a $15 million increase in the credit facility from the Goldman Sachs Urban Investment Group will allow for the expansion and ensure the long-term stability of the system, making it more reliable and accessible for the thousands of New Yorkers who rely upon it. New Yorkers currently take more than one million trips every month on Citi Bike. The Citi Bike system, which will continue to be operated by NYC Bike Share (NYCBS), a subsidiary of Alta, will be expanded from the current system of 330 stations and 6,000 bikes to over 700 stations and 12,000 bikes by the end of 2017. Citi Bike will stretch further out into Brooklyn, into Harlem, and bring bikes to Queens for the first time. The agreement with the City also calls for service enhancements to the system’s operations for Citi Bike’s tens of thousands of riders, including upgrades to the software and technology that helps operate the bike share system. These enhancements will be made possible by the investment from Bikeshare Holdings LLC, a newly-formed venture of individuals that include Harvey Spevak, CEO of Equinox®, Jeff Blau, CEO of Related Companies, and Jonathan Schulhof, a private investor who led the transaction. Bikeshare Holdings has entered into an agreement to acquire Alta and recruited Jay Walder, the former Chairman and CEO of the Metropolitan Transportation Authority and an internationally-renowned leader in public transit, to serve as the incoming CEO of Alta. The system will continue to operate as a privately funded program and Citi has agreed to increase its sponsorship contribution by $70.5 million dollars and extend it through 2024 while the Goldman Sachs Urban Investment Group has increased and extended its loan facility to help fund the program’s enhancement and expansion. The expansion was also made possible by a $5 million investment from The Partnership Fund for New York City to Bikeshare Holdings LLC to support the program’s growth into underserved communities in Brooklyn, Queens and Upper Manhattan. “This is about delivering the bike share program New Yorkers expect and deserve. We believe in Citi Bike’s potential as a fixture of New York City’s public transit system. It can make our neighborhoods more accessible, help us achieve our sustainability goals, and bridge inequities in our transportation network. To achieve all that, bike share has to be reliable and responsive to community’s needs. Today, after tremendous efforts across our administration, we can say we have the management and the support in place to fulfill that mission. It’s a good day for New Yorkers who rely on Citi Bike, and for neighborhoods and riders that have eagerly awaited its expansion,” said Mayor Bill de Blasio. Jay Walder, a proven leader and experienced executive, will bring to Alta and Citi Bike extensive international experience in the public transportation business, which includes 30 years working in rail, property, and infrastructure in the United States and internationally. Most recently, Mr. Walder was the Chief Executive Officer of MTR Corporation in Hong Kong. Previously, he was the Chairman and Chief Executive Officer of Metropolitan Transportation Authority (MTA) in New York. The rate for an annual program membership, also for unlimited 45 minute rides, will become $149. This change is necessary to provide world-class service for this hugely popular and well-used system, making it financially viable for the long-term. The price change will go into effect at a date to be announced shortly. Citi Bike is also exploring possible weekend, monthly and tourist membership. Residents of the NYC Housing Authority and members of select Community Development Credit Unions will still be eligible for discounted Citi Bike memberships for $60 a year. 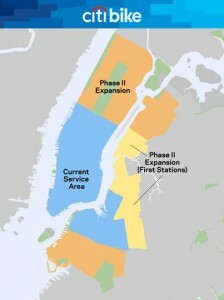 Under the terms of the agreement the Citi Bike service area will expand in Manhattan into Harlem, as well as into Astoria, Long Island City, Greenpoint, Williamsburg, Bushwick, Prospect Heights, Crown Heights, Park Slope, Carroll Gardens, Boerum Hill, Cobble Hill, Red Hook, Gowanus, and more of Bedford-Stuyvesant. This builds out the existing service area, which includes Manhattan below 59th Street, Brooklyn Heights, Downtown Brooklyn, parts of Bedford-Stuyvesant, parts of Williamsburg, Clinton Hill, Fort Greene and DUMBO neighborhoods in Brooklyn. The expansion, which will begin in 2015, will commence in Long Island City, Greenpoint, Williamsburg, and the rest of Bedford-Stuyvesant. The City hopes to expand the program to include additional neighborhoods in the future. The further expansion will require additional financing, and the Department of Transportation will work closely with stakeholders to make those plans feasible. “Today’s announcement is a great win for all New Yorkers because we have been able to successfully expand the city’s bike share program. The expansion will now serve transit starved communities like Red Hook, Brooklyn where there is no direct subway service and only one bus route. This deal also brings new software to the entire system, which will improve the user experience and accessibility for riders. Going forward, we must not forget to expand this great program into more neighborhoods in the outer boroughs,” said Public Advocate Letitia James. “The expansion of New York City’s bike share program is truly something to celebrate, said Council Member Robert E. Cornegy, Jr. Cycling is healthy for individuals, for families and for communities & the more cyclists join the party, the safer we all become. Although a price hike is always difficult to swallow, maintaining this program and expanding the fleet are critical and the new pricing, with discounts for New Yorkers with fewer economic resources, will keep this program healthy. I look forward to seeing many more stations and more bike share users on city streets in 2015. “The expansion of Citi Bike to some neighborhoods in the outer boroughs is an accomplishment for communities who live and work outside of the principal transportation catchment areas. Biking as a transportation alternative raises issues around environmental equity, access to transportation as a right, and quality of life. In that spirit, we have been looking legislatively at the significance of bike-share programs and, perhaps even more importantly, at how New York City can facilitate program expansions by investing in biking infrastructure like bike lanes, and bike safety campaigns, throughout the five boroughs. In neighborhoods that are transportation starved–like Red Hook and Sunset Park—non-traditional alternatives become essential to the functioning of community. I am heartened by the possibilities that this initial expansion presents to our City,” said Council Member Carlos Menchaca. “I am very excited to see the bike share program grow, as was always the plan, and I am eager for the UWS to be considered as a site,” said Council Member Helen Rosenthal. “Out of the gate the bike share program was a success. It only makes sense to expand the program especially in the proposed areas of my district. And to ensure the continued success of the bike share, I’m pleased to see that the suggest a station online portal will be available again. I commend Mayor de Blasio for remaining committed to this program and to the New Yorkers that have made it the success that it is,” said State Senator Martin Malavé Dilan. “I look forward to the Citi Bike program’s arrival to Greenpoint and Williamsburg in the coming year. The quickly growing population in my district needs all the modes of transportation they can get. I fully anticipate that this expansion of Citi Bike to my district will be done with the community’s input on where docking stations should be located. I have consistently found that local neighborhoods know their area better than anyone and can offer suggestions that end up being well accepted by everyone,” said Assembly Member Joseph R. Lentol. “Alternative transportation in New York City has grown exponentially in the past decade and I am pleased to see the reduction of carbon admission by the decreased dependency on fossil fuel based motor vehicles. I applauded the Mayor’s initiative to not only secure the financial feasibility of the New York City bike-sharing program, but also expand it to historically underserved communities. I hope we can continue to move our city towards being a truly green city,” Assembly Member Walter T. Mosley. “I think this is a great opportunity for the Queensbridge, and Long Island City community, because it promotes healthy living, as well as another option to get around our City. I am also pleased that the price for NYCHA residents will remain the same, giving all New Yorkers and opportunity to enjoy this much needed service. I’m excited and welcome this in our community,” said April L. Simpson, President Queensbridge Tenants. Citi Bike has proven hugely popular, serving upwards of 40,000 people per day through the spring, summer and fall. Citi Bike currently has over 90,000 annual members and more than 641,000 short-term passes have been used. Since launch, Citi Bike riders have taken over 14 million trips and have ridden over 25 million miles. The expansion is expected to create a significant number of new jobs in New York City. New York City Bike Share LLC has committed to instituting local recruiting initiatives and offering skills training. All jobs will pay at or above living wage. In addition, Alta is relocating and consolidating its corporate headquarters in New York City. DOT will continue its outreach efforts to the neighborhoods included in the proposed expansion as part of the specific site selection process. The first installment of the program rollout included a multi-year outreach process, which included over 400 meetings with Community Boards, elected officials, civic associations, property owners and community institutions. New Yorkers will again be able to suggest a new Citi Bike rack location at nyc.gov/bikeshare as DOT re-opens ‘Suggest a Station” siting portal. There have been no fatalities or serious injuries to Citi Bike riders in the nearly 14 million trips made on the system since its launch. The system continues to promote safe riding with rules of the road displayed on the handlebars of each bike. The Department of Transportation distributes free bike helmets at events across the city and continues to encourage their use.